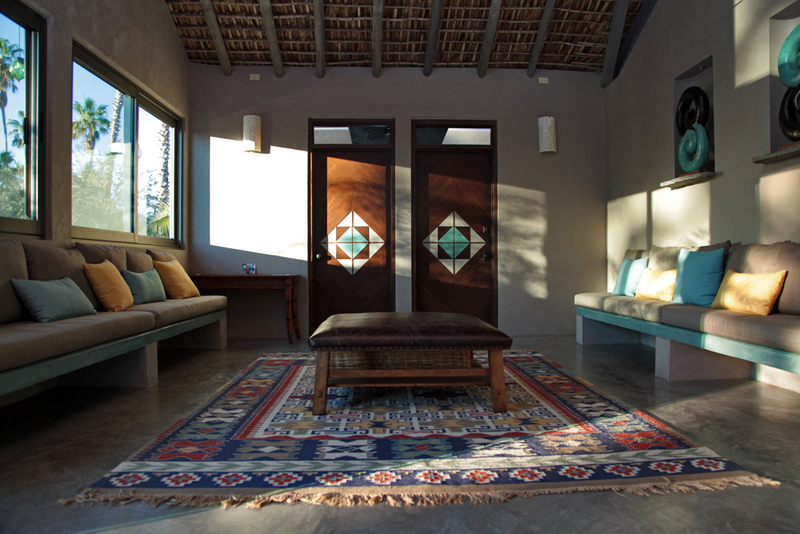 CUATRO VIENTOS IS A UNIVERSAL SPACE FOR THE PRACTICE & TEACHING OF YOGA, HEALING ARTS, MEDITATION, MOVEMENT AND PERSONAL GROWTH IN TODOS SANTOS, BAJA CALIFORNIA SUR, MEXICO. Cuatro Vientos is located on Calle Horizonte, in Todos Santos, BCS, Mexico, across the side street from La Esquina Cafe & Bar. Cuatro Vientos opened in January 2015. The building and gardens were intentionally designed to be in harmony with the nature. Cuatro Vientos means Four Winds and the building itself was designed in alignment with the four directions. Its grounds include a large, state-of-the art studio space with a high palapa roof, wood floors and giant windows overlooking a variety of native and tropical plants. The studio is surrounded by shaded patios and winding pathways leading to contemplative spaces where you can relax in peace and take in the natural environment. Cuatro Vientos offers ongoing classes as well as non-recurring workshops throughout the year. The studio is also available to rent for special events and annual conferences, including: Women Awakening & Sangha Yoga Fest. Cuatro Vientos is open year round, the class schedule varies from month to month so please check the latest schedule. The center runs as a cooperative. There is no receptionist on site. Please pay the teacher directly for your class. Class prices vary. You can find the cost for each class on the schedule. Most teachers offer a multiple class discount. There is no need to sign up ahead of time, just show up a few minutes early for any ongoing class. Some workshops & events do require pre-registration, in those cases, the teacher will indicate how to sign up. Teachers may rent a weekly time slot for an ongoing class. • The studio is also available to rent for non-recurring workshops, events, & talks. • Cuatro Vientos is not a retreat center. There are are no accommodations or food services available. • If you are interested in teaching an ongoing class or renting Cuatro Vientos for a workshop or event, please contact Marimar at cuatrovientosbaja@gmail.com.